"On this day in 1875, Billy the Kid is arrested for the first time after stealing a basket of laundry. He later broke out of jail and roamed the American West, eventually earning a reputation as an outlaw and murderer and a rap sheet that allegedly included 21 murders. The exact details of Billy the Kid's birth are unknown, other than his name, William Henry McCarty. He was probably born sometime between 1859 and 1861, in Indiana or New York. As a child, he had no relationship with his father and moved around with his family, living in Indiana, Kansas, Colorado and Silver City, New Mexico. His mother died in 1874 and Billy the Kid—who went by a variety of names throughout his life, including Kid Antrim and William Bonney—turned to crime soon afterward. McCarty did a stint as a horse thief in Arizona before returning to New Mexico, where he hooked up with a gang of gunslingers and cattle rustlers involved in the notorious Lincoln County War between rival rancher and merchant factions in Lincoln County in 1878. 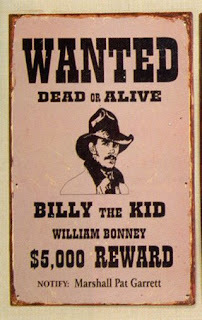 Afterward, Billy the Kid, who had a slender build, prominent crooked front teeth and a love of singing, went on the lam and continued his outlaw's life, stealing cattle and horses, gambling and killing people. His crimes earned him a bounty on his head and he was eventually captured and indicted for killing a sheriff during the Lincoln County War. Billy the Kid was sentenced to hang for his crime; however, a short time later, he managed another jail break, murdering two deputies in the process. Billy the Kid's freedom was brief, as Sheriff Pat Garrett caught up with the desperado at Fort Sumner, New Mexico, on July 14, 1881, and fatally shot him. Although his life was short, Billy the Kid's legend grew following his death. Today he is a famous symbol of the Old West, along with such men as Kit Carson, Jesse James, Wild Bill Hickok, Doc Holliday and Wyatt Earp, and his story has been mythologized and romanticized in numerous films, books, TV shows and songs. Each year, tourists visit the town of Fort Sumner, located about 160 miles southeast of Albuquerque, to see the Billy the Kid Museum and gravesite." I hope you enjoyed this random post about 'Today in History'. Just picking a random day to search from past events will surprise you! I didn't know all these events had happened on September 23. ^.^ I promise to post more of these in the future. Wow. 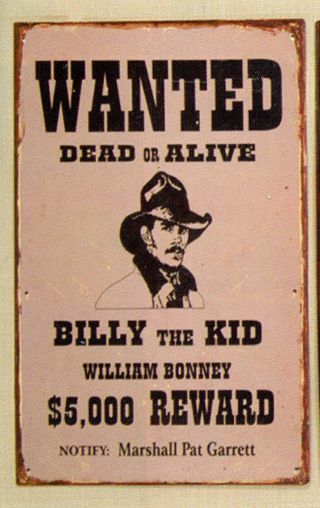 Billy the Kid died on my birthday! COOL!! !